Gone are the days when it was “cool” to not know what Twitter was. Or any form of Web 2.0 technology that enables you to connect to the bigger picture. 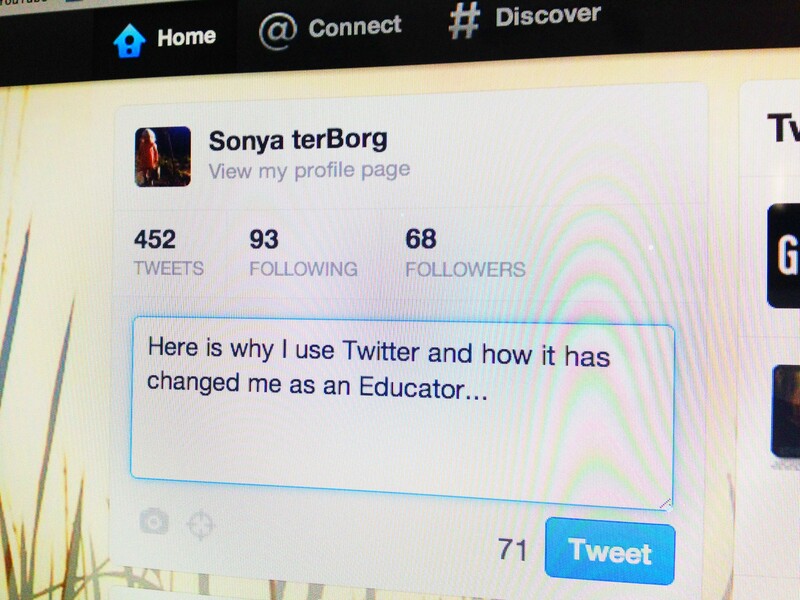 I took a while to become a fan of Twitter and now, I can’t imagine my life as an Educator without it. But first, came the change in my mindset or my world view and then came for the need for a tool to support that change and that tool happened to be Twitter. That is worth me repeating. Seriously. First came the change, then came the need for a tool. I really don’t mind if you use Twitter or not. What I do think is important, is that you challenge yourself to maintain a connection with other people wanting make the same kind of ruckus you are making – or wanting to make. Over the last six months or so, I have become more active on Twitter and would site this tool as being in the top ranking of the Professional Development that I have gotten as a teacher. Why? Because I am connecting with other Educators and we are not bound by geography. We are able to quickly share in 140 characters or less, what is going on in our classrooms and to connect. Learned about the Top Ten Things NOT To Do in an iPad 1:1 Program. I particularly liked number ten: Do not let fear overcome your mission. This could be said for almost anything we do and plays nicely back to yesterday’s post about the Resistance. Been inspired by the amazing work happening at my former school, Yokohama International, in a post titled Tech Pilots Taking Off. It really is inspiring to not only read about a phenomenal program, but I am both blown away and grateful for the thorough documentation of the implementation and goals for this program. The example set here of initiative, forward-thinking, collaboration and leadership is truly outstanding. What’s more, it is not being hidden but put out there for others to use, copy, emulate, remix and build upon. Did I mention I am inspired? Been taken through a very thorough analysis of what it means for a project to be authentic. “What Does It Take For A Project To Be Authentic?” gives great understanding about the use of the word authentic as it applies to Project Based Learning (PBL) or just learning in general. It cleared up a few wonderings I had and has given me a new lens through which I can take a look at the assessment of and for learning that occurs in my classroom. Spoken often of the amazing work in inquiry-based learning that I experienced first-hand in the classroom of Tasha Cowdy. I was so excited to see Tasha post about the Morning Meeting routine she establishes with her kindergarten class. It is phenomenal and so empowering and a must-see for anyone interested in inquiry teaching and learning. Been reminded of a tool I was introduced to a a couple of weeks ago called Thinglink but have not explored fully. Turns out I can now benefit from other’s explorations via the post 26+ Ways to Use ThingLink in the Classroom. Been introduced to a new app called Kids Journal which I have not downloaded (yet!) but could be a fun tool for easily documenting summer activities such as the Summer Bucket List challenge we just set our fifth graders as a ‘prewriting’, information gathering exercise for their first sixth grade writing assignment in the new school year. And this is just the surface! I use Instapaper as my ‘read later’ service. When on Twitter or browsing the internet, one click of ‘Read Later’ and all these goodies get stored on my Instapaper account – kind of like my own awesome newspaper of awesomeness. I keep my Twitter account mostly for following educators but also writers, artists, musicians, curators, innovators, movers and shakers. I want to know what is new and exciting in education but also around education – we are not in isolation. If tweeting is not for you, fine. But I encourage you to find some way of connecting yourself to big ideas in a way that works. You will thank yourself and your parents and students will thank you even more. Next postTechnology and Innovation Advisor – What’s that? I think that part – the part I had to say twice – was the big ‘aha’ moment for me. I think some people hear “Twitter” and already have a mindset made up about what that means. I know I did. Being selective about who I follow and having a purpose for using it (to be connected, to learn, to share, to collaborate) has helped me really get a lot out of it. Thanks for your KC post. I am inspired!